Rentals are also available for the whole house which sleeps up to 7. If you truly want to experience history and the whole funky New Orleans vibe, you’d be hard pressed to do better that this. 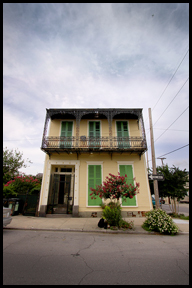 The house has been featured in films, HBO’s Treme, has been photographed by world renown photographers, and is due to be in an upcoming book on Creole New Orleans. The house is located blocks from the French Quarter and is 1 mile exactly from City Park and the Fairgrounds for Jazz and Voodoo Fest.